A bone scan is a nuclear medicine imaging test which uses bone-seeking radioactive materials or tracers (radiopharmaceuticals) and a computer to create an image of the skeleton (bones). A bone scan looks at the bones to see if there are any abnormalities, such as a fracture, tumour or infection.1 A radiopharmaceutical (dye) is injected into a vein of the hand or arm and for a bone scan, Technetium 99m (Tc-99m) is usually used. The radiopharmaceutical travels through the blood and collects in the bone where there is increased activity such as bone growth, bone break, or repair. TC-99m is highly controlled and tested for safety and has a half-life of about 6 hours.6 As a result, the body expels it quickly. The majority of the dye completely decomposes in the body, and the rest is removed through urine and feces. Unlike some forms of radioactive medicine, there is no need to be sequestered from your family to protect them from radiation. Drink lots of fluids – staying hydrated allows the body to rid of remaining radiopharmaceuticals which are eliminated through the urine. -Supplement with NAC (N-acetylcysteine) – it works as an antioxidant that enhances the body’s immune system and to detoxify heavy metals. -Increase super-foods into your diet, such as camu, maqui berry, moringa, which are all nutritionally dense and antioxidant rich. -Support circulation, elimination and organ health. Things such as detox baths with Epsom salts, Himalayan salt, or clay, lymphatic massages or skin brushing will help the body to metabolize substances faster. -Binders such as Chlorella, Clay, and Activated Charcoal can help to bind the metals so that they are removed through elimination. Siegel JA, Welsh JS. Does imaging technology cause cancer? Debunking the linear no-threshold model of radiation carcinogenesis. Technology in cancer research & treatment. 2016 Apr;15(2):249-56. Verdun FR, Bochud F, Gundinchet F, Aroua A, Schnyder P, Meuli R. Quality initiatives radiation risk: what you should know to tell your patient. Radiographics. 2008 Nov;28(7):1807-16.
International Atomic Energy Agency(IAEA) : Technical report series 466: technetium-99m radiopharmaceuticals: manufacture of kits. IAEA, 2008. Jagetia G, Baliga M, Venkatesh P. Ginger (Zingiber officinale Rosc. ), a dietary supplement, protects mice against radiation-induced lethality: mechanism of action. 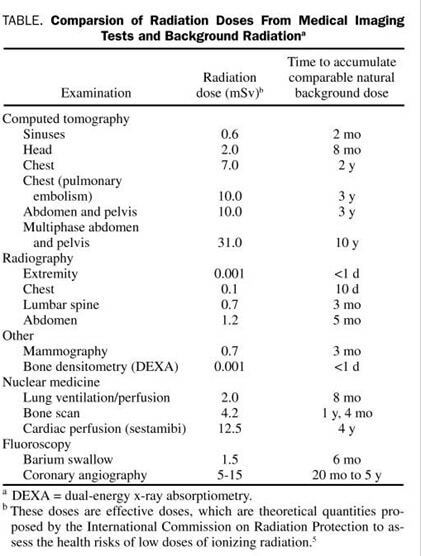 Cancer Biother Radiopharm. 2004 Aug;19(4):422-35. Lee HJ, Kim JS, Moon C, et al. Modification of gamma-radiation response in mice by green tea polyphenols. Phytother Res. 2008 Oct;22(10):1380-3.